We know that there’s a huge amount of great DI activity taking place up and down the country, being taken forward by public, private and voluntary sector organisations alike. We try to get out and see good examples of this in action as often as possible, so late last year we visited Leeds to see a number of Digital Inclusion initiatives in action. One of the first things we did in Leeds was visit a really innovative project that provides WiFi to local communities via the travelling HUGO Bus (Helping U Get Online). We visited it in Meanwood at The Stonegates estate. On board it’s like a cross between a tour bus and a first class train carriage, fully equipped with laptops, a kitchen and a lounge. 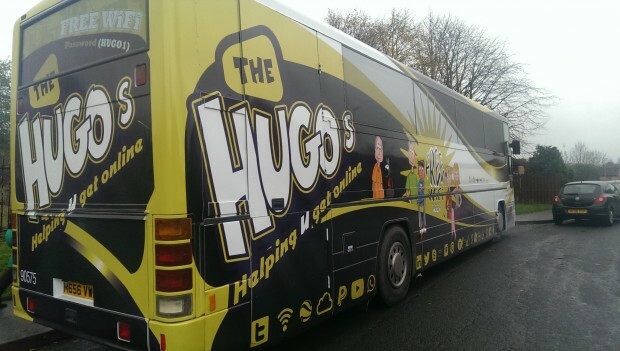 Your friendly hosts are people like Neighbourhood Initiatives Coordinator, Cath Nelson, who told us about taking the HUGO Bus to Hunslet in South Leeds last year. We had the kids on board playing football games on the computers. The great thing was that, when this inspired them to go into the park to play the real thing, the parents stayed on the bus and learned how to use the laptops themselves. Leeds Federated, or ‘The Fed’, are the Housing Association behind the HUGO Project. They realise that not everyone will be able or inclined to come to places offering digital skills support, so they formed a partnership with First Bus and the DWP’s Digital Deal Challenge Fund to take the HUGO bus to them. Sue Jennings, Community Development Manager and Digital Inclusion Lead, believes in thinking innovatively when it comes to supporting her residents. “We think about digital skills for our residents in the same way we think about their heating and water: it’s a ‘must have’”. The HUGO Centre at The Fed HQ is home to a dozen computers and a team of staff and volunteers who support the training and personal development of any local resident, whether they are Fed customers or not, and however complex their needs. As Sue says on The Fed website, “We want to inspire people by showing them how much fun the internet is and the benefits it brings”. The innovation doesn’t stop here. The Fed are hoping to build a WiFi enabled skatepark in The Stonegates. That’s something we’ll have to come back to see. Here at GDS we are committed to designing everything with the users’ needs at the top of the list, and Leeds Libraries think the same way. 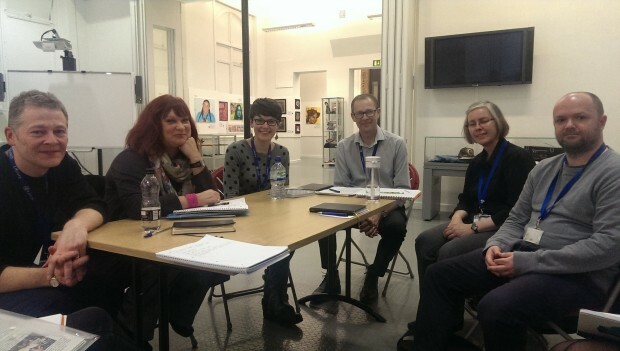 We met with librarians to talk about the innovative ways in which they are increasing Digital Inclusion and Skills to deliver real benefits in the community. More than a decade ago, Leeds Libraries made the decision to train their own staff to deliver digital skills to the public rather than use funding to bring in other agencies to do so. This means they now have a network of Digital Champions across the city who embrace new technology, share its benefits with citizens and can adapt quickly when new challenges and opportunities arise. The level of digital expertise in Leeds Libraries is such that they can bid for Community Learning funding in competition with private sector training providers, colleges and universities - but they don’t just compete, they win: the contract has gone to Leeds Libraries for each of the last ten years. We’ve run projects on gaming, family history, designing a City of Leeds for the future. We even ran a Leeds Museum event aimed at parents using Minecraft as a learning tool. WiFi will allow us to work even more creatively and use the whole of the library space rather than being confined to learning rooms. Leeds is a great example of modern Libraries using a multitude of services and linking them all together. The shelves are still stacked high with leatherbound tomes, but they’re side by side with interactive whiteboards and PCs. You might still come in to borrow a book, but could leave having landed a new job, started an IT course, got your business off the ground at the Business & IP Centre, or produced your new music video, album or film at the fantastic Studio12. Digital Inclusion is at the heart of Leeds Libraries, and whatever services you’re looking for, inspiring, expert staff will make sure they work at your pace to give you the skills that suit your needs.